Aloha from the Hawaiian island of Oahu which is home to the state capital city of Honolulu and the world-famous beach resort of Waikiki. Long the preserve of surfing royalty and featuring heavily within the awesome Hawaii Five-O, Waikiki presents a typically exotic vision of Pacific perfection with swaying palms and hula girls as far as the eye can see. Of course, scratch the surface and you’ll quickly discover that there’s much more to Waikiki than purely screen-saver shots and if you’re in the mood for some Polynesian culture or WWII history then you won’t have to explore too far to find it. However, this being one of Hawaii’s best-loved places to visit there’s no point in avoiding the beach any longer so don your: shirt, shades and lei, and you’ll already be half-way to getting two tickets to paradise – book ‘em Danno! 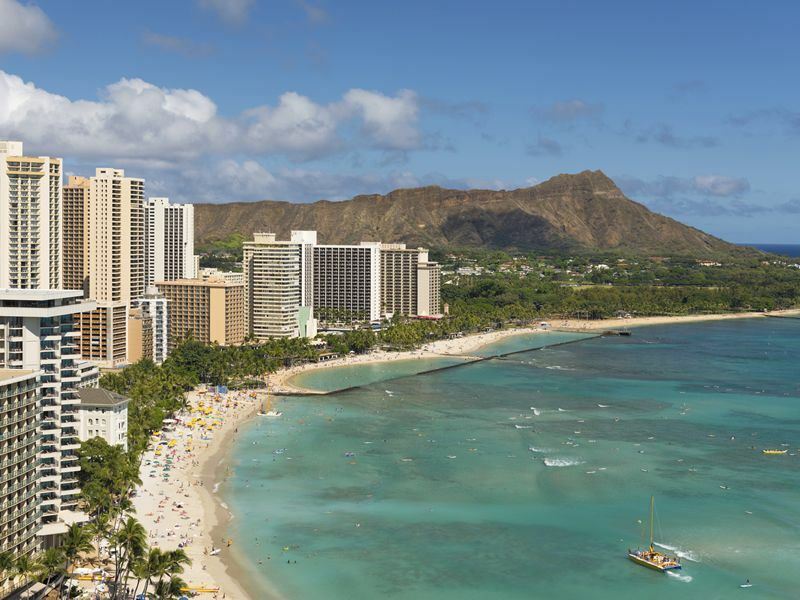 Although Waikiki beach is moderately small, extending from the Ala Wai drainage canal to the volcanic cone of Diamond Head, it’s got plenty of plus points, especially for wannabe surfers. Thanks to the shallow nature of the shoreline it’s pretty straightforward to get your board on and as there’s a partitioned section of the Pacific designated just for surfers you won’t have to worry about crashing into any wading tourists. The break is pretty much perfect for newbies and provides an endless succession of rollers so you get to try and try again to stand up and scream ‘look at me ma!’. Although things can get a bit fierce when the wind’s up there’s still plenty of reasons to visit Waikiki if you’re not interested in serious surfing and from white sands and palm trees to public parks and man-made pools, life’s a beach so get your shorts on. There are plenty of daytime alternatives to the soft sands of Waikiki beach and if the weather’s a bit rough or you just fancy a change of scene then there’s an aquarium, zoo and cultural theme park which are well-worth a visit. The theme park, in particular, is especially worthwhile if you’re interested in finding out more about Polynesian culture as there’s eight typical villages displaying all manner of arts, crafts and customs as well as an IMAX cinema and guided canoe trips around the lagoon. Of course, no trip to Hawaii is complete without finding out more about the attack on Pearl Harbour and the part Waikiki and the island as a whole played in WWII. The US Army Museum at Fort DeRussey and the USS Arizona Memorial around the bay in Pearl Harbour, are both excellent facilities for learning more about the island’s past and definitely worth visiting even if just to pay your respects. Aside from the man-made history of Waikiki, checking out the natural drama of Diamond Head’s tuff cone is definitely up there with top things to do on Oahu. Take the 1 mile hike that includes plenty of steps and unpaved paths en-route to the observation platform and unbridled views of the Pacific. Basically, if you want to eat inside or out then Waikiki’s got numerous options to suit all budgets and tastes. Cocktails at sun set over the water, seafood grills right on the beach and all-day dining accompanied by live local musicians provide just a taste of the Waikiki food scene and strolling into downtown Honolulu will give you a whole lot more besides. Bubba Gump, Hard Rock and NYC deli’s are all available however, taking a sunset dinner cruise just about tips the balance if you fancy pushing the boat out. Keep it local and you’ll be spoiled for choice with no end of Pacific Rim dishes, American fast-food and the freshest of fresh fruit on display no matter which way you turn. There’s a generous helping of clubs, bars and resort hot spots to check out if you’re staying overnight in Waikiki and from sophisticated cocktail lounges overlooking the ocean to live Polynesian performance shows, you’re bound to find the right pace to suit you. Rum Fire night club boasts the only actual beach front setting however, you won’t have far to go to find more nocturnal action with the likes of: Rumours on Atkinson Drive, Mai Tai Bar at the Royal Hawaiian on Ala Moana Boulevard and Moose McGillycuddy’s (which holds Waikiki’s premier bikini contest) all promising plenty of fun once the sun is done. Aside from the live music, fruit cocktails and dance floors, Waikiki also has plenty of cafés and juice bars to help you revive flagging spirits after a day at the beach with many staying open late into the evening. As with most places popular with tourists, making sure you keep your wits about you is certainly recommended and although Waikiki is fairly safe, walking the beach after dark or opting for a spot of night swimming can lead to difficulties so take care and stay safe. More information and to book: Well-known for its awe-inspiring beaches, friendly people and romantic locations, Hawaii takes the lead for wedding and honeymoon locations and more.